You might have heard it already: The next incarnation of the OpenMP specification, which is targeted to be released as version 3.1 around June in time for IWOMP 2011 in Chicago, has been published as a Draft for Public Comment. You may think of it as beta :-). 1: Development of an OpenMP Error Model. There is nothing new on this topic in OpenMP 3.1. 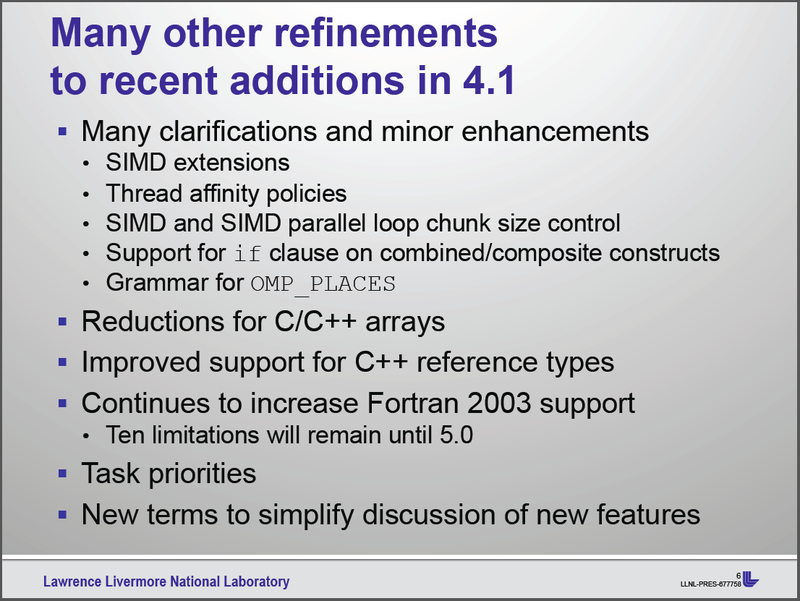 However, with respect to OpenMP 4.0, the so-called done directive has been discussed for quite some time already. It can be used to terminate the execution of a Parallel Region, or a Worksharing construct, or a Task construct, and it is a prominent candidate for the next OpenMP spec. It would provide necessary functionality towards full-featured error handling capabilities, for which there is no good proposal that could be agreed upon yet. 2: Interoperability and Composability. There is nothing new on this topic in OpenMP 3.1. We made several experiments, gained some insights, and the goal is to come up with a set of reliable expectations and assertions in the OpenMP 4.0 timeframe. 3: Incorporating Tools Support into the OpenMP Specification. There is currently no activity on this topic in the OpenMP Language Committee in general. 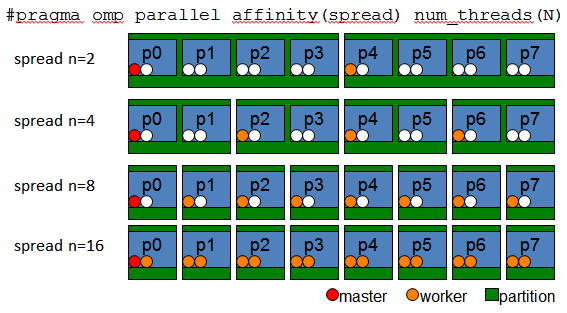 4: Associating Computation or Memory across Workshares. There is little progress in this direction to be found in OpenMP 3.1. The environment variable OMP_PROC_BIND has been added to control the binding of threads to processors, it accepts a boolean value. If enabled, the OpenMP runtime is instructed to not move OpenMP threads between processors. The mapping of threads to processors is unspecified and thus depends on the implementation. In general, introducing this variable that controls program-wide behavior was intended to standardize behavior found in almost all current OpenMP implementations. 5: Accelerators, GPUs and More. While there is nothing new on this topic in OpenMP 3.1, the Accelerator subcommittee put a lot of effort into coming up with a first (preliminary!) proposal. This is clearly interesting. From my personal point of view, OpenMP 4.0 might provide basic support for programming accelerators such as GPUs, thus delivering a vendor-neutral standard. Do not expect anything full-featured similar to CUDA, the current proposal is rather similar in spirit to the PGI Accelerator approach (which I do like). However, this is still far from being done, and may (or may not) change directions completely. The crucial aspects are to integrate well with the rest of OpenMP, and to provide an easy to use but still powerful approach to allow for bringing certain important code patterns to accelerator devices. 6: Transactional Memory and Thread Level Speculation. There is in general no activity on this topic in the OpenMP Language Committee and apparently it dropped from the set of important topics. Personally, (now) I do not think TM should be a target for OpenMP in the forseable future. 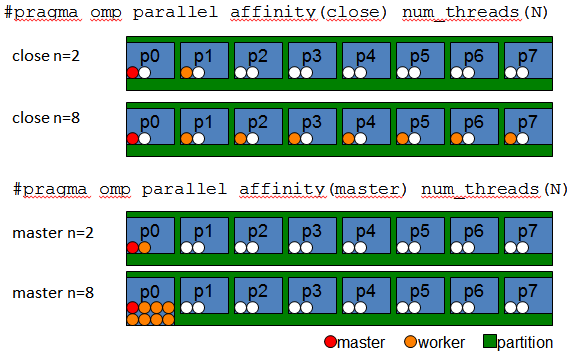 7: Refinements to the OpenMP Tasking Model. There have been some improvements to the Tasking model, with some more on the roadmap for OpenMP 4.0. The taskyield directive has been added to allow for user-defined task scheduling (tsp) points. A tsp is a point in the execution of a task at which is can be suspended to be resumed later; or the event of task completion, after which the executing thread may switch to a different task. The mergeable clause has been added to the list of possible task clauses, indicating that the task may have the same data region as the generating task region. The final clause has been added to the list of possible task clauses, denoting the execution of all descending tasks sequentially in the same region. This implies immediate execution of final tasks, and ignoring any untied task clauses. An optional scalar expression allows for conditioning the application of the final clause. 8: Extending OpenMP to C++0x and FORTRAN 2003. There is nothing new on this topic in OpenMP 3.1. We closely follow the development of the base language and it has to be seen what can (or has to) be done for OpenMP 4.0. Anyhow, the fact that base languages are introducing threading and a thread-aware memory model leads to some simplifications on the one hand, but also could lead to potential conflicts on the other hand. We are not aware of any such conflict, but digging through the details and implification of a base language such as C++ as well as OpenMP is a pretty complex task. 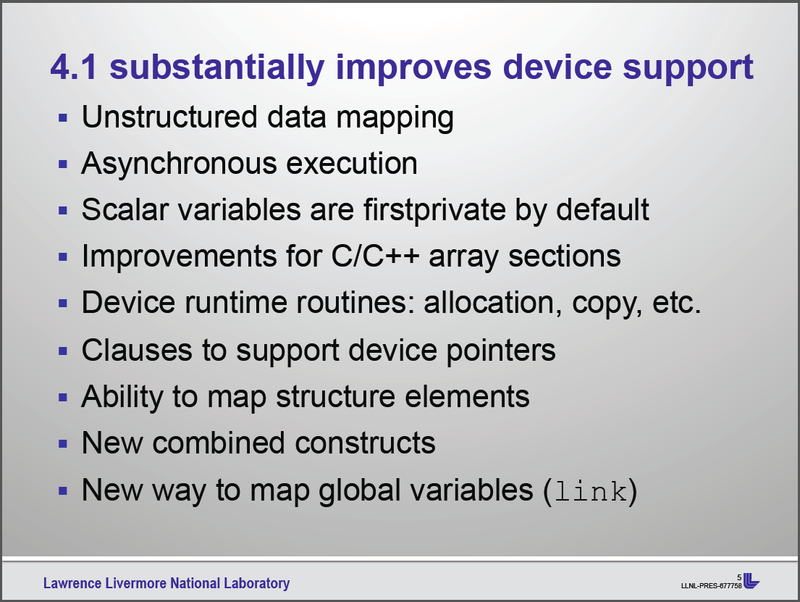 9: Extending OpenMP to Additional Languages. There is nothing new on this topic in OpenMP 3.1, and currently there is no intention of doing so inside the OpenMP Language Committee. Personally, I would like to see an OpenMP binding for Java, since it would really help teaching parallel programming, but I do not see this happen. 10: Clarifications to the Existing Specifications. There have been plenty of clarification, corrections, and micro-updates. Most notably the examples and description in the appendix have been corrected, clarified, and expanded. The atomic construct has been extended to accept the following new clauses: read, write, update and capture. If none is given, it defaults to update. Specifying an atomic region allows to atomically read / write / update the value of the variable affected by the construct. Note that not everything inside an atomic region is performed atomically, i.e. the evaluation of “other” variables is not. For example in an atomic write construct, only the left-hand variable (the one that is written to) is written atomically. The firstprivate clause now accepts const-qualified types in C/C++ as well as intent(in) in Fortran. This is just a reaction to annoyances reported by some users. The reduction clause has been extended to allow for min and max reductions for built-in datatypes in C/C++. This still excludes aggregate types (including arrays) as well as pointer and reference types from being used in an OpenMP reduction. We had a proposal for powerful user-defined reductions (UDRs) on the table for a long time, it was discussed heavily, but did not make it into OpenMP 3.1. That would have made this release of the spec much stronger. Adding UDRs is a high priority for OpenMP 4.0 for many OpenMP Language Committee members, though. omp_in_final() is as new API routine to determine whether it is called from within a final (aka included) task region. 12: Additional Task / Threads Synchronization Mechanisms. There is nothing new on this topic in OpenMP 3.1, and not much interest in the OpenMP Language Committee that I have noticed. However, we are thinking of task dependencies and task reductions for OpenMP 4.0, and both feature would probably fall into this category (and then there would be a high interest). Let me point you to some HPC events in June 2009. 5th International Workshop on OpenMP (IWOMP 2009) in Dresden, Germany. The IWOMP workshop series focuses on the development and usage of OpenMP. This year’s conference is titled Evolving OpenMP in an Age of Extreme Parallelism – I think this phrase is a but funny, but nevertheless one can clearly observe a trend towards Shared-Memory parallelization on the node of even the extremely parallel machines. Attached to the conference is a two day meeting of the OpenMP language committee. The language committee is currently discussing a long list of possible items for a future OpenMP 3.1 or 4.0 specification, including but not limited to my favorites Composability (especially for C++) and Performance on cc-NUMA system. Bronis de Supinski, the recently appointed Chair of the OpenMP Language Committee, will give a talk on the current activities of the LC and how the future of OpenMP might look like – I hope the slides will be made public soon after the talk. Right before the conference there will also be a one day tutorial for all people interested in learning OpenMP (mainly given by Ruud van der Pas – strongly recommended). High Performance Computing Symposium 2009 (HPCS) in Kingston, Canada. HPCS is a multidisciplinary conference that focuses on research involving High Performance Computing and this year it takes place in Kingston. I’ve never been at that conference series, so I am pretty curious how it will look like. Attached to the conference are a couple of workshops, including Using OpenMP 3.0 for Parallel Programming on Multicore Systems – run again by Ruud van der Pas and us, and Parallel Programming in Visual Studio 2008 on Windows HPC Server 2008 – organized by us as well. Here in Aachen, the interest in our Windows-HPC compute service is still growing fine and thus we have usually around 50 new participants in our bi-yearly training events. The HPCVL people asked explicitly to cover parallel programming on Windows in the OpenMP workshop, so we separated this aspect out without further ado to serve it well. The workshop program can be found here. International Supercomputing Conference (ISC 2009) in Hamburg, Germany. ISC titles itself as Europe’s premier HPC event – while this is probably true it is of course smaller than the SC events in the US, but usually better organized. Without question you will find numerous interesting exhibits and can listen to several talks (mostly by invited speakers), so please excuse the self-marketing of me pointing to the Jülich Aachen Research Alliance (JARA) booth in the research space where we will show an interactive visualization of large-scale numerical simulation (damage of blood cells by a ventricular device – pretty cool) as well as give an overview of our research activities focused on Shared-Memory parallelization (we will distribute OpenMP syntax references again). If you are interested in HPC software development on Windows, feel invited to stop by at our demo station at the Microsoft booth where we will have many demos regarding HPC Application Development on Windows (Visual Studio, Allinea DDTlite and Vampir are confirmed, maybe more …). And if you are closely monitoring the HPC market, you have probably heard about ScaleMP already, the company aggregating multiple x86 system into a single (virtual) system over InfiniBand – obviously very interesting for Shared-Memory parallelization. If you are interested, you can hear about our experiences with this architecture for HPC. If you want to meet up during any of these events just drop me an email.